People of Ukrainian ethnicity have brought many cultural traditions with them since they first started coming to Canada in the late 19th century. While folk arts such embroidery and hand-decorated Easter eggs endure, the art of the homemade cemetery marker has been lost. This essay examines that lost craft with a special emphasis on examples resulting from the author's extensive photography in Ukrainian cemeteries. 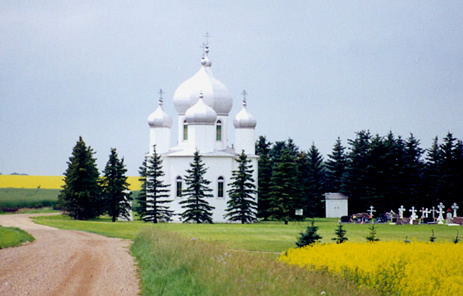 Welcome to the Ukrainian Churches of Canada Web Site. This site is committed to exploring the glory and the beauty of Ukrainian churches. Its goal is to increase awareness of Ukrainian churches in this country; to provide a small amount of historical background; promote discussion regarding trends of architecture and art; and to help in the preservation of churches that form the very foundation of Ukrainian-Canadian culture. This work is dedicated to our Ukrainian ancestors who, over a hundred years ago, began to immigrate in large numbers to Canada in search of a better world in which to raise their families. They took a great gamble but fruits of that gamble have been sweet. All photographs on this site are by Sterling Demchinsky unless otherwise identified. All quotations from Scripture are from the New International Version of the Holy Bible.